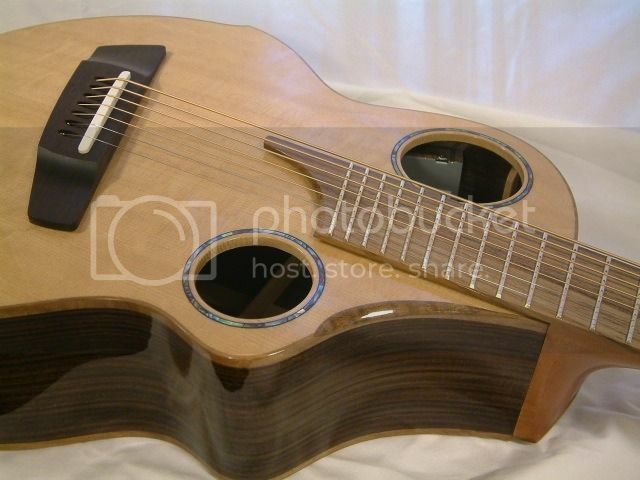 Strings for fanned fret 7 string acoustic? 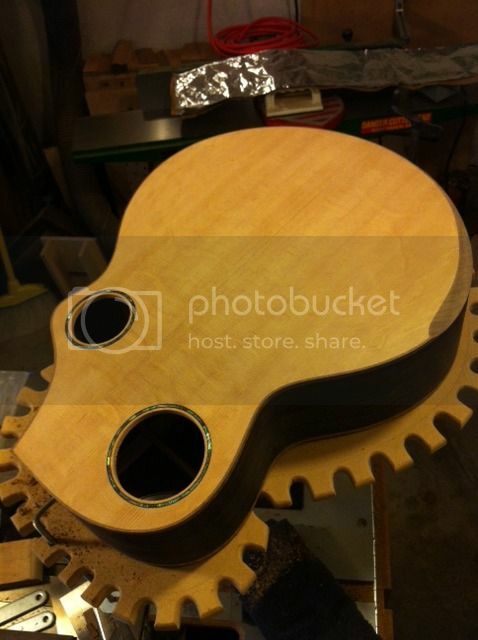 Discussion in 'Acoustic Instruments' started by s2y, Feb 16, 2012. 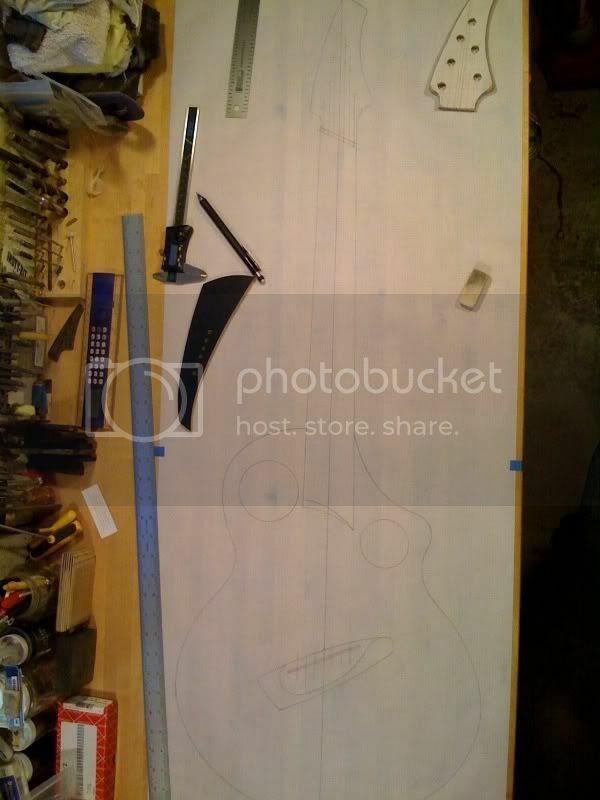 I have a KR Guitars 27-25" 7 string that's being built and gettin' there. I was thinking D'Addario 12-53 with a .070 B from Juststrings.com. Any thoughts or opinions? You going B on the low? That would a good choice. It feels about like what I would call a "medium" on my 27 inch baritone tuned to B. Maybe a touch looser feeling than a medium but it isn't going to slide off the fretboard every time you grab it or anything. The goal is to tune to B and use standard 7 string tuning. I'm kinda guessing. I prefer coated strings since I have a "few" guitars and less is more when it comes to maintenance. I hate coateds. I've just evolved into a really great and fast restringer But with a "custom" set it will save you some money to use coateds, that's for sure! I don't particularly like the feel of coated strings, but it's an even trade in my mind for strings that last longer and doing less string changes. Are there other coated strings besides D'Addario and Elixer? Beyond coated strings, any recommendations if the D'Addarios aren't my cup o' tea? On my 27.0"-28.5" fan fret baritone, I'm still experimenting with strings and gauges so take what I say with a grain of salt haha. I could be wrong but I'd guess you won't get great sound going all the way to B on a 27" scale. It's probably going to be a bit flubby. Usually guys who want to go down to B are doing 28-29" scale lengths, but I suppose a lot depends on how hard you strike the string too. As for brands, I'm going through that right now too. I've been a fan of the Thomastik-Infeld strings for a while and they sound great on mine - but they are super expensive. I've also been trying the Newtone Masterclass and I like those a lot too. I'm really only at the very beginning of this journey to learn what strings/gauges I like though. I've only had my baritone for about a month. I play with the sixth string tuned to B exclusively on a 27. Well, I do drop it to A on some "Low C" Celtic stuff because then I only have to move 2 strings from Open G to get there. And the low A is most definitely meh , but you don't pedal away at it in Celtic like blues or Slack Key. You really have to experience the guitar "out in front" of the stage before you can make the "flubby" Judgement in terms of tone. And of course it's going to vary from guitar to guitar. What YOU hear may very well be different from what develops 15 feet away from you. Like I said earlier, after a minute or two you adjust to the slightly flubby feel, and don't push the string off the fretboard. And the feel is good enough as long as the sound works as far as I'm concerned. When I first got my baritone, the bass sounded weak to me, so I would hit it harder to where I perceived it as the same volume as say the 2nd string. Big mistake in the case of my particular guitar! Lucky I had a friend out there who came up and basically said "Dude, I know you like the new guitar, but you don't have to hammer us with that bass every time you hit it!" It was a shocker. As to brand I stick to Baritone sets from Pearse. They have a Medium Gauge Bronze Wound set you might be interested in. Item # 3280M. 17, 24Wound, 32, 34, 56, 70. You could just add a 13. 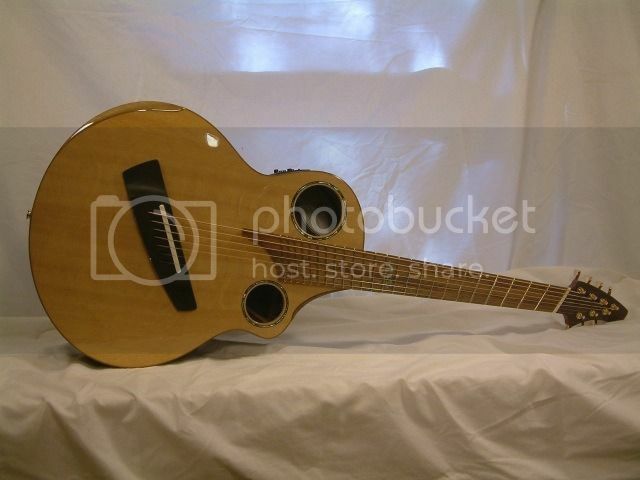 If the cost works for you, it would be a lot easier to regularly find a 13 string at your local shop than a .070! I've used a variety of their baritone sets, from 15-68 to 18-76. Good stuff. Reasonable price too considering it ain't no EJ-17 which is my standard on my normal guitars. You can usually get away between $7 to $10 depending on the size. Not bad considering you aren't getting something that's produced in the millions like Daddarios. I would have liked to go longer, but the other part of my equation was wanting a 25" scale high E.
I also would like longer, but with every door that opens another closes. I hope to have a 28.5 someday, but I would have to drastically change my approach. I can quite literally make every move on the 27 I make on a 25.5. Not the same story on a longer scale one for me. Still want one of course! Out of curiosity, do you fingerpick or flatpick that 6th string? I think that makes such a difference. 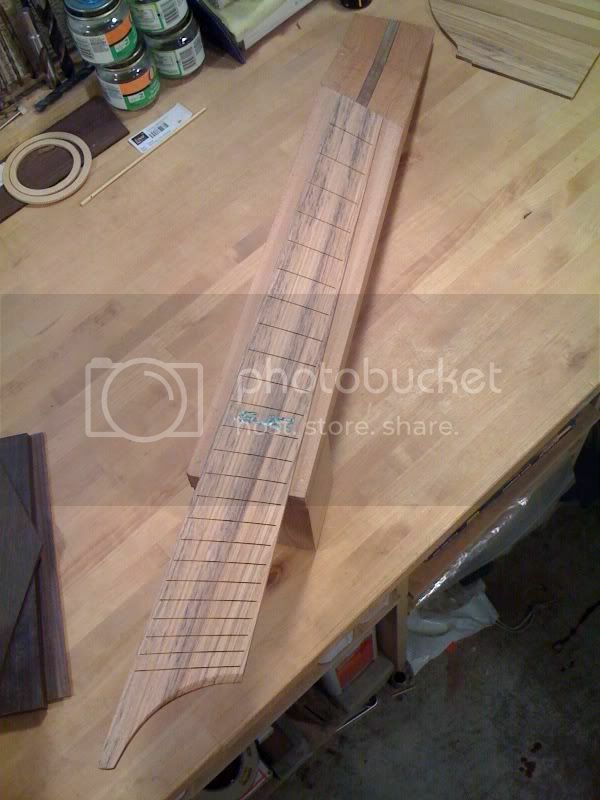 I was reading a thread in which Matt Mustapick (famous baritone/fanned fret builder) said that he favored the 13-56 on a 28.9" scale baritone for tuning down to B. I asked him that same question and he said he liked it for fingerpicking. I'm a flatpicker on that string at least and he agreed that, for flatpicking, he might like to try thicker strings. 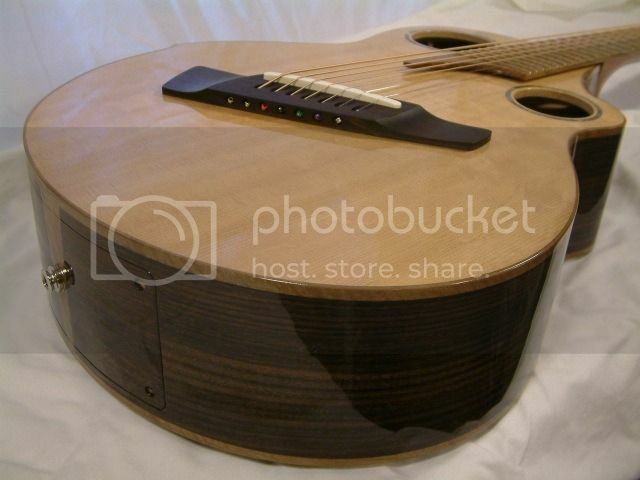 Also out of curiousity, does your baritone have a port/hole? Mine does but I swear - I don't think I hear the guitar any different/better as a result! I fingerpick, but with plastic finger and thumb picks. And my attack is pretty brutal. My favorite string setup is 18-76, but even direct from Pearse, I can have delays and often have to use a lighter set. I play a National Tricone baritone. So volume isn't a problem out in front. But as I mentioned, what I hear and what others are hearing are two different things. I haven't yet owned a guitar with a soundport. Would love to spend some serious time with one. Here's a vid of Bob Brozman tearing it up on a national baritone. I'm a fairly light player. Then you should be fine with whatever reasonable choice. 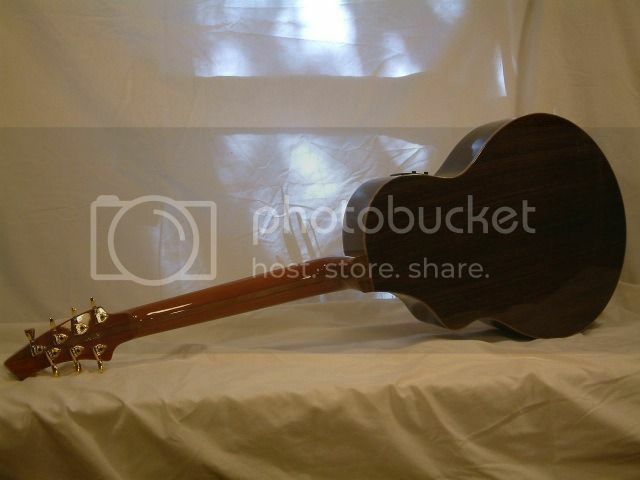 Play around with where along the string you pick the low B.
BTW, here's a pic of the body. Oh that's neat! I've never seen on like that. That's a serious cutaway too! The bevel on the binding of the cutaway area is mesmerizing to me. I could stare at that one spot for an hour.